We were very excited to be able to sponsor and host Las Vegas Interactive Marketing Association’s fourth annual creative media awards. 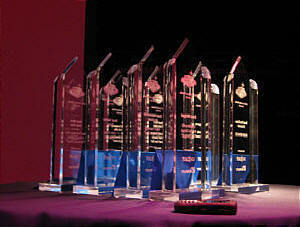 The competition featured eight award categories and participation from many of the top entertainment venues in Las Vegas including MGM Grand and Cirque du Soleil. - Best Advergame - Ideawork - "Zumanity Roses"
- Best Mini Web Site - New York-New York Hotel - "Vinny vs Vinny"
- Best Company Web Site - SK+G Advertising - "CityCenter"
- Best Interactive Ad Units - R&R Partners - "Chinchilli Day"
- Best Viral Campaign - MGM Grand's "Tweet Your Sin"
- Best Widget - Earthbound Media Group / Harrah's - "Rio Widget"